Arbour crunches your data, filtering it through the complicated Incentive Program rules and provides accurate reporting ensuring you are aware of every potential billing. It is not a disease registry which simply outputs a list of patients - Arbour incorporates billing and diagnostic history, showing you what you should bill today. We provide an easy-to-use workflow to quickly review incentive opportunities. Profile, Oscar, Osler, Med Access, Wolf...we work with them all. 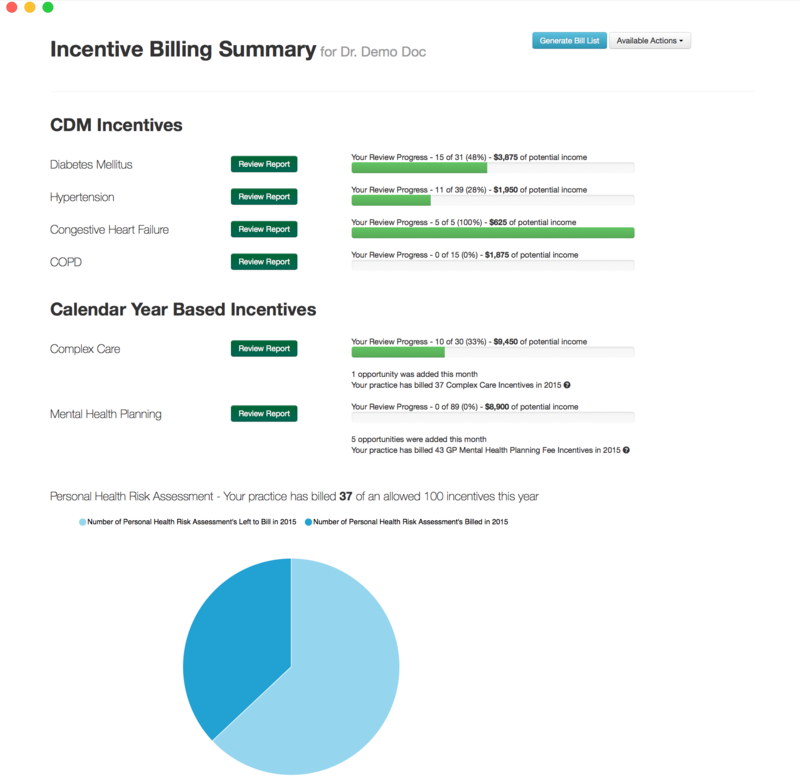 Regardless which EMR you use, Arbour can help you maximize your incentives and get on top of your billings. Fitting Arbour into your office workflow is easy. Being web-based, there is no new software to buy and install, and no IT staff training required. Get access to your unique reporting in a matter of days. Monthly emails remind you to login and review what incentives you are eligible to bill. No long-term contracts or lock-in allows you to use our services only as long as we are providing real and measurable value to you. By necessity, we have intimate knowledge of the Incentive Program and its complicated rules. Our support staff are always on hand to answer any questions you have. "I started my practice in July 2017 and had heard about Arbour's services in a billing seminar. I am using OSCAR and it already has some tools for help but I found it very unfriendly and not complete. Arbour helped me to have a good understanding of the patients with complex care and using Arbour's services on a regular basis gives me peace of mind that I will not miss any opportunities. It helps a lot in billing and income, as well as making sure I am calling patients in and providing better care for them. I do recommend Arbour to all physicians who do complex care." "Arbour Medical has been extremely helpful with my incentive billings. As a clinician working for over 20 years and an experienced EMR user, I thought I was highly accurate in my ability to track these billings. Arbour demonstrated that despite this, I was not maximizing my incentive billings. I receive monthly notifications from Arbour and, although I continue to be diligent in setting up my incentive billing schedules and reminders, Arbour is always able to generate items that were missed and therefore able to maximize my billing potential." "Very few practices maximize their incentives. Arbour makes it easy for my clients to do so - they finally have an accurate, actionable list of every potential incentive, as well as knowledge around when they should bill to maximize income. Ultimately, their billings increase significantly, and they feel more on top of their chronic and complex patients." "Arbour has generated thousands of dollars of billings for our practice and streamlined our incentive billing. Our MOA’s and myself have been impressed with how easy it is to use as well as with the high accuracy of the reports."